Because of the Factory Reset Protection embedded in the Android 5.0 version of the Android operating system, it can get very difficult for you to access your phone again after factory resetting it in case you have bought the phone from a third party or when you forgot your Google account username or password. Fortunately, there is a solution to this problem. In order to Bypass Google account Samsung verification in your Samsung phone, you should read this article and take note of the many methods, all solutions for 2017, to bypass Google account. Note that such techniques will help you bypass Google account verification in your Samsung phone, whatever version of Samsung it may be. So this covers the J series such as the J5 2016, J7, J7 prime, and even the lower versions like J2. This also covers Samsung s6, s7, s7 edge, and s8. There are various methods and techniques that can be used to bypass Google account. All point to the same direction and that is bypassing the Google Account Verification after resetting a phone back to its factory settings so that the phone can be used by a user once again. However, not all of these techniques can work in your phone. But it is sure that one or more of these techniques will work on your phone. Therefore, you should try such techniques until you find one suitable technique that will work in your smartphone. 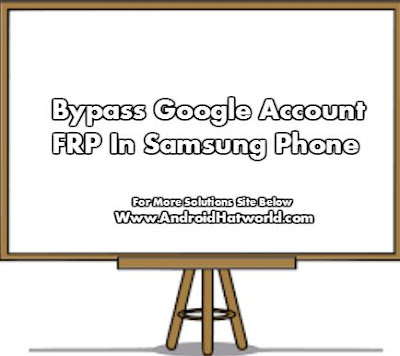 Bypassing Google account verification in your Samsung phone to be able to proceed with the factory reset can really appear to be a very tedious task. However, if you will just pay attention to the details of each step, you will find the method, whichever method, to be very easy to accomplish. One recommendation when following the steps is to really try it or even practice it before doing the real thing. Explore your phone and take note of the location of the several options in your Samsung phone settings. Just remember that whatever method you choose in bypassing the Google account verification stage in your Samsung phone to be able to factory reset it, all methods points out to the same direction. So do not be afraid to try one or more method if some does not work on the first try. If you have any suggestion about the article Bypass Google Account FRP in Your Samsung Phone then feel free to ask any question. Use Below Comment Section to ask question we will glad to ask any questions from us then will do responsive replay to your Question..